The most common cause of failure in a catalytic converter in an older car is that it becomes so clogged that the exhaust gases can’t get through it to the muffler and out of the car. If air can’t get out the rear of the vehicle, it can’t come in the front end, so the engine dies because no air is coming in to form the fuel/air mixture. 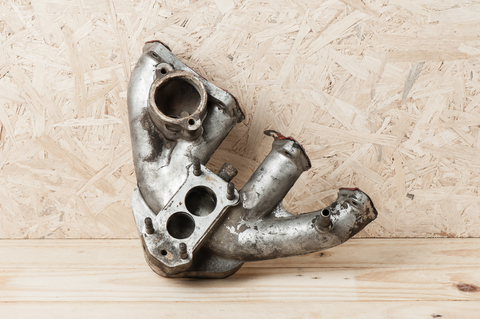 Another common problem related to catalytic converter failure is a leaking exhaust manifold. In order to prevent this from happening, and avoid some costly repairs, Park Muffler has put together a quick guide to leaky exhaust manifolds and catalytic converter failure. Like any car problem, there are always signs to indicate that something is wrong. Here are some signs and symptoms to look out for if you’re concerned about your exhaust system. Cracked pipes: If you see a crack in one of your exhaust pipes, it’s almost guaranteed that it’s leaking. Increased noise when starting the engine or accelerating: While a noisier car can be a symptom of many different issues, when combined with some of the other issues on the list it can point to a leaking exhaust manifold. Change in fumes: You may notice a stronger smell, more exhaust fumes, or even a change in the colour of exhaust fumes. This is a huge red flag and should be investigated immediately. An increase in other exhaust fumes can also mean an increase in carbon monoxide, which is colourless, odourless, and incredibly dangerous. Drop in fuel economy: Notice that you’re stopping at the gas station more than you used to? That’s a clear sign that something is wrong with your vehicle. Failure to accelerate when stepping on the gas: While every car accelerates differently, all cars should speed up when you step on the gas pedal. If not, something is amiss. Check engine light comes on: While the check engine light can indicate any number of problems, when combined with some of the above symptoms it’s an indication that you need to check the catalytic converter. Even if it isn’t your exhaust manifold or catalytic converter, any of these signs can indicate that there is some sort of problem with your vehicle. Don’t wait. Bring your car in right away and address the issue before it becomes a larger problem. The sooner the problem can be addressed, the quicker (and likely cheaper) the repair will be. Park Muffler has been offering expert automotive services to Sherwood Park and Edmonton since 1979. Whether you have an exhaust issue, are looking for performance upgrades, or simply need a tune up our team can help. Contact us and book an appointment today!